Tell me these aren't just the cutest Halloween treats! 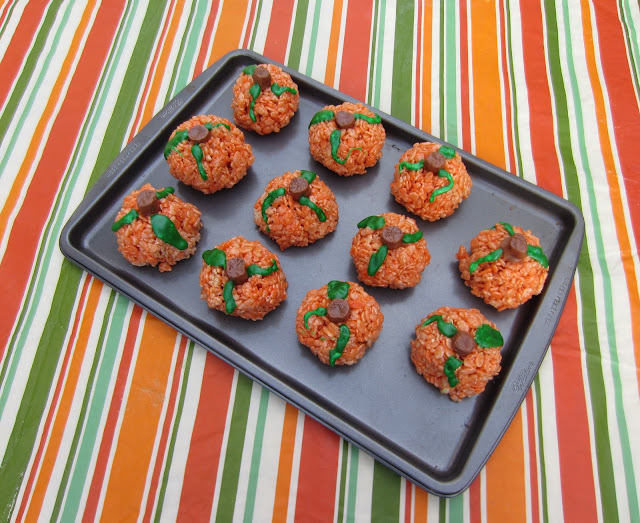 Rice Krispies contacted me and asked if F&B and I would like to try out the recipe and the kids were thrilled. Not only are they adorable pumpkins, they have a surprise inside (mini Milky Way bars)! Better still, they are easy to make and look amazing. Ben has already requested that this is what he wants to bring for his class Halloween party (yes, we can bring homemade food, yay!) and Faith now wants to do the same. Want to make a batch for yourself? 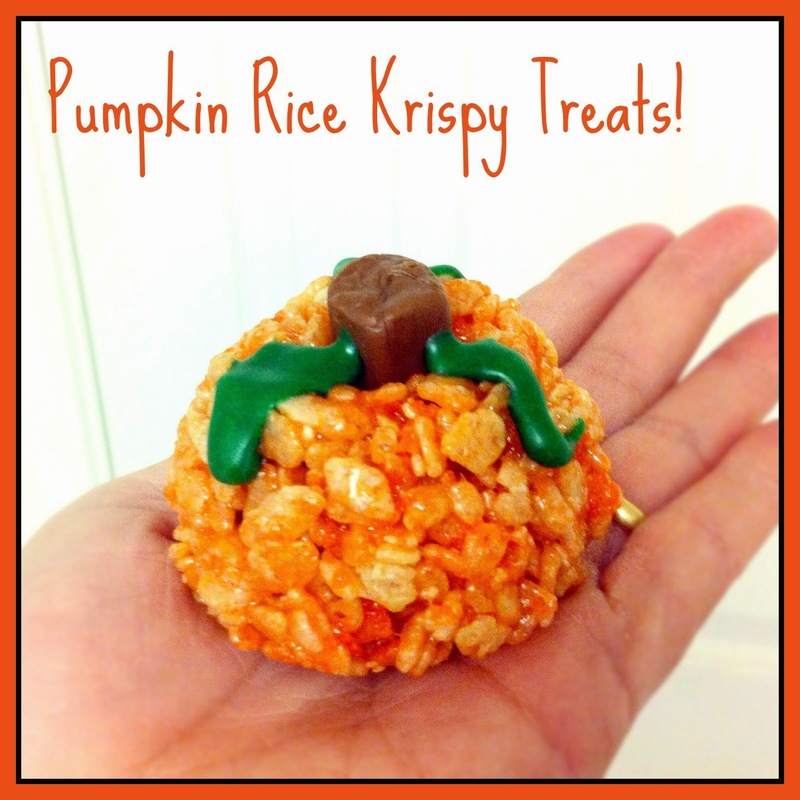 Check out the recipe below, then enter to win a prize pack from Rice Krispies with everything you need! 1. In large saucepan melt butter over low heat. Add marshmallows and stir until completely melted. Remove from heat. Tint with orange food coloring. 2. Add KELLOGG’S RICE KRISPIES cereal. Stir until well coated. 3. Using 1/2-cup measuring cup coated with cooking spray divide warm cereal mixture into 12 portions. 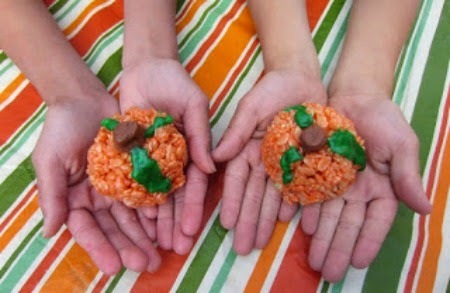 Using buttered hands shape each portion into pumpkin shape around one candy piece. 4. Pipe frosting onto each for vines and attach gumdrop for stem. For the Tootsie Rolls instead, cut each one in half and make an indentation for the stem with the tip of your finger, press into place. My favorite part of Halloween is the Pumpkin shaped Reese's peanut butter cups! My favorite part of Halloween is dressing up. K makes me and her father dress with her. It is usually a themed Halloween for us. Now I wish I'd signed up for the treat at the preschool fall party instead of the craft! My favorite part of Halloween is the extra activities/experiences I get to share with my daughter -- like pumpkin patches, pumpkin carving, picking out costumes, and trick-or-treating. AW! These pumpkins are so CUTE. Those are so cute! Easy too. My favorite part is seeing John get all excited about his costumes and trick or treating! He typically starts planning in August!!! My Mom made something similar out of cheerio's for my class Halloween party when I was a kid. Super cute! My fav part of Halloween is seeing my 3 kids bouncing with excitement as they are putting their costumes on!!! They KNOW they look good! I love dressing up! As a theatre person, it's always what I look forward to. My favorite part of halloween is helping my kids dress up and then taking them trick or treating so everyone can see their costumes... I'm kind of sad that my oldest is not wanting to ToT this year, but he's still dressing up to stay home and hand out candy with his dad. I love eating candy! The creepy decorations! The tricks! All of it! My favorite part of Halloween is booing our neighbors. Dressing my little girl up and making her she has a good time. We love the decorations and trick or treating together! I love decorating! I go all out in my front yard!! I also love the excited in the kids eyes. I love to carve pumpkins and pick out costumes. My favorite thing about Halloween is handing out candy to the kids and seeing their costumes. These are so cute :)...I would love to make these with my little man! I like carving pumpkins and making special yummy treats! My favorite part of Halloween is making spooky halloween themed threats! I love carving pumpkins and roasting the seeds!